i b i k e l o n d o n: Cycling to Suffrage - who will get more women on bikes? Cycling to Suffrage - who will get more women on bikes? Women need men like fish needs bicycles, or so the saying goes. But joking aside, the bicycle has played an integral role in the emancipation of women in Great Britain - from the fashionable lady cyclists of the 1890s right through to the Suffragette movement. This week is your last chance to see an exhibition charting the rise and rise of women on two wheels at The Women's Library here in London. But is the liberating relationship between women and bikes just a thing of the past, or is there still a role for the bicycle to play in creating a more equal society? Victorian women demonstrate their cycling skills. Film from the BFI Mediatheque. "Cycling to Suffrage" closes on Saturday at the Women's Library in Aldgate. Documenting the relationship between women's lib and bicycles from 1890 to 1914, the small foyer display includes photographs of early female cycling pioneers, first hand accounts of Edwardian "Suffrage Scouts" and their bikes, and explores how the bicycle was integrated in to the tactics of the women's rights movement. How about cycling from Land's End to London in full Edwardian dress? Or can you imagine a time when a woman could not "go out" in society (on a bike or otherwise) without their husband or a suitable chaperon? Sylvia Pankhurst, daughter of Emeline and sister to Christabel, from that great line of suffragists explains her relationship with her bicycle; "Christabel had already been demanding a bicycle in 1893 but the Doctor [their father] shrank at the thought of his young daughter riding in traffic and it was not until 1906 that she had her way... ..Our parents took it as a matter of course that if Christabel rode, I must go with her as her companion - we were now entered as members of the Clarion Cycling Club. Henceforward every available day was spent in cycling. Though the journeys were often too long for me and I could scarcely pedal the last miles, the Sundays with the club were pleasant. It was delightful to be out in the country away from the grime of Manchester. There were usually some slow women riders amongst the company but the men were kind in helping to push one up the steepest hills. It was whilst riding alone with Christabel that I endured a veritable torture. My crimson face and gasping breath were the wordless answer to her impatient "Come on!". Afraid of being considered a nuisance I would strain and strive till it would seem that my heart would burst. Finally she would disappear from me, climbing some hill and arrive home sometimes an hour before me. I remember being thrown over the handlebars and rising up so shaken that I had to walk for some distance before I could re- mount, whilst she rode on not noticing that I had ceased to follow." Of course, it wasn't just in political and activist circles that the bicycle has had a profound effect on women. In the countryside the bike has been accredited with diversifying the gene pool of villagers who could now roam further afield to find suitable mates(! ), whilst the bicycle gave a woman an autonomous means of getting about without having to rely on a man for transport for the first time. American feminist Susan B Anthony claimed the bicycle "has done more to emancipate women than anything else in the world." 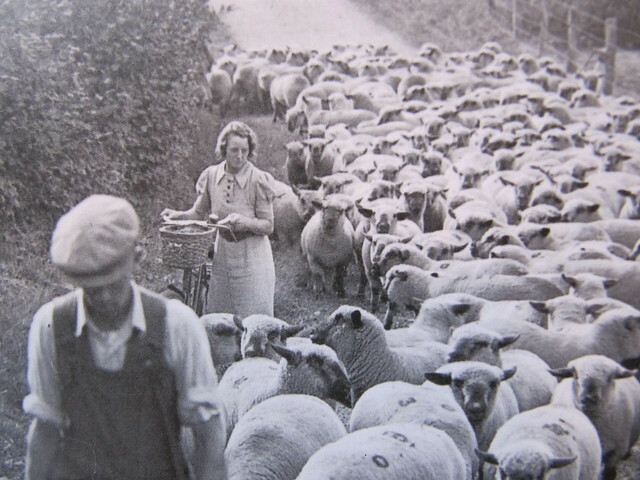 In later years the bicycle allowed women to go out to work and to look for it further afield - an old University lecturer of mine used to recall how she would cycle down to Kent from London every September in the 1950s to go hop picking with her girl friends and that it was a time of unbridled joy and liberation. Even today, the car is more likely to be used by the man in single car families; there is plenty of opportunity for more journeys to be made by women on bicycles. But in today's Britain is a great disparity between the number of men who cycle and the number of women who do. 79% of all UK cycle journeys are made by men, even though fewer women hold a driving license or have access to a car. Tragically, despite fewer women than men riding in London more of them have been killed over the past 10 years by lorries and HGVs. 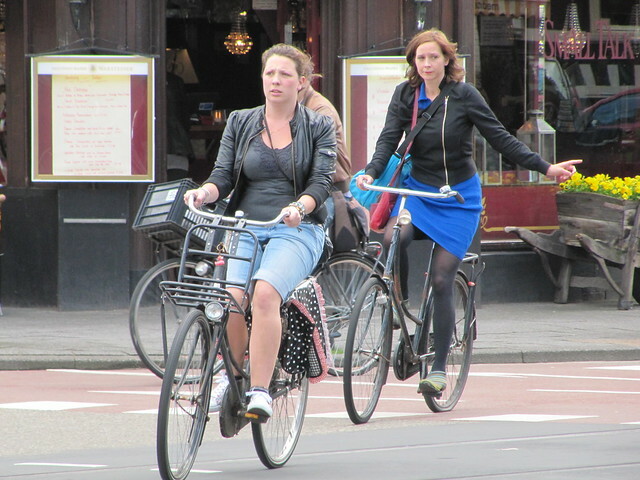 You only need hop over the North Sea to the Netherlands to see what safe and respectful cycling conditions can do to make both men and women young and old feel safe and comfortable. But here in the UK when we invite women to cycle we're asking them to not only do something which many might consider dangerous (if they've even considered it previously at all before) but to also make themselves a minority within a minority on the road. Are the likes of Victoria Pendleton and Joanne Rowsell our latter day Suffragettes and Susan B Anthonys? Or does the problem lie at a political level and with those who control the lay out of our roads and cities? In 21st Century Britain who will lead women out to cycle again? I was amazed at the male/female cyclist ration in Portsmouth: on a recent visit there were far more women on bikes there than anywhere I've seen in the UK. Is it that it's flat, or is there a 20mph halo effect on to other roads (ore considerate driving) that is encouraging more women and girls to take to two wheels? That's interesting, Will, I had heard that there had been stirrings in Portsmouth and that more and more people were taking to their bikes there. I think, perhaps, when you start to get real mass cycling rates it is not down to one single thing but the accumulative effect of lots of things; flatness, relative speeds on shared roads, cycle parking, high quality infrastructure on non-shared routes etc. I've believed for a long time now that here in the UK our problem is often that cycle advocates themselves only champion their own cause; some think it is all about 20mph zones, others believe the key is in training, and only push for their corner. The key, of course, is that we need all of these things and more. It's good to hear that there is a better gender balance in Portsmouth - long may it continue! "we need all these things and more"
I read that the women outraged London society when they started cycling in Battersea Park and wearing "Bloomers" trousers on the bikes. It's easy to underestimate the resistance they overcame for the right to cycle in public. Coincidentally on the north side of Battersea Bridge is Sylvia Pankhurst's house on Cheyne Walk. @George Thanks. It's a very big hill we're pushing our bikes up, but we've got to get to the top somehow! @Paul You're absolutely right - the prospect of women wearing "men's clothes" in order to ride comfortably and safely shocked many in society. There were also all sorts of strange slightly pervish concerns fascinated with the effects of saddles on femininity which I think, perhaps, still haven't gone away entirely today. If you're not familiar with the story of Annie Londonderry, the woman who scandalised America by cycling around the world alone, in trousers, you should definitely look it up! Rare Collections of video. I admit, I have not been on this video in a long time... I have great time spend in this blog. I never expect this. really nice. Anyone who's an LCC member can nominate themselves - by 10am on Mon 10 Sept. Why not do it yourself, or perhaps encourage someone you know? Ben Irvine at Cycle Lifestyle has suggested that the development of a revitalised London Cycling Network would inspire more women to cycle. Interestingly, I have just looked at the last 100 signatories of the LCMC petition, and it looks like about 43% are women. I think the questions Mark poses at the end of his post are really interesting. Our sporting heroes are an inspiration and have brought cycling to the attention of many people who perhaps weren't interested in cycling before. However, they are athletes and it's difficult to relate to them as an utility/commuter/leisure cyclist. When I first got into cycling I saw women on their bikes on the streets of London and thought, "This seems feasable for me, I could do this." Similarly, I imagine seeing the Suffragettes riding around town in bloomers would have caught the imagination and attention of many people, both men and women. The women I speak to about cycling, who don't cycle themselves, overwhelmingly say they would love to cycle but they fear the traffic, they feel like they have to wear lycra/helmets/hi-viz and that they think it's not safe. I think it requires political will to change how our roads are designed and operate so they are safer and easier to use. However, something needs to change on a societal level too. There are too many negative stereotypes and misconceptions about cycling that discourage women from taking up cycling and make our roads more aggressive than they need be, e.g. the road tax brigade and their ilk. Something that doesn't get mentioned often is that women experience more instances of street harassment than men (see http://ash-campaign.org/) and that's before we've even gotten on our bikes. Myself and the women I know who cycle experience a different kind of street harassment that is frequently of a sexual nature and may also involve dangerous or threatening driving. Personally, I experience more street harassment on my bike than off, which can really ruin my ride. @FruityBlue I think if anything that the petition demonstrates just how much women would like more cycle-friendly conditions. @Annisa Harassment in the streets is not something I'd thought about when I wrote this article, but it should have been. People I know have shared very similar experiences to you, even from drivers at high speed pulling alongside them and behaving outrageously as both vehicles travel down the road. This sort of behaviour by a minority of men is not just disgusting it is downright dangerous. With regards to negative stereotypes discouraging women from cycling sadly these can even come from our own fellow cyclists; the kiss and jersey giving girls on the podium of the major bike races spring to mind, as does a recent advertising campaign by a new bike apparel start up which proclaimed their products were proudly 'not for girls' (the insinuation being that girls had no need for performance bike wear because they couldn't ride bikes fast enough) How common a problem is this sort of thing? Being a man unfortunately I don't know, and I don't know how to go about fixing it either, other than hoping that one day women will be such a common site on a bike that no one will blink an eye and everyone will feel that they could do the same. Are you saying that the development of a comprehensive, city-wide cycle network would not make for more cycle-friendly conditions? Eeek! Sorry for the misunderstanding. I suspect most people who currently cycle do so despite, not because of, any infrastructure provided for them. The reason why Cambridge ranks top is no doubt at least partly because of the student population, who either can't afford cars or can think of better ways ot spend their money. Portsmouth certainly has some quite reasonable cycle lanes, 20 limits and a fairly benign motoring population, but its cycling uptake is more driven by historic and geographical factors which predate the positive measures. I expect women cycle there because you can't park a car at work, and can only park one car at home, in the warren of Edwardian terrace streets which make up most of the housing stock - and yes it is usually the man of the house who gets the car. Among the factors which I imagine influence women's choice of the bicycle, alongside safety concerns, harrassment, availability or lack of alternatives etc, must surely be what is offered by retailers. I expect most people buy bikes at chainstores, and those are heavily dominated by men's bikes. The women's range is often just a crappily feminised verison of the mens bikes, and neither the men's nor the women's bikes are really fit for purpose - MTBs to ride flat city streets, with no mudguards, chaincase, lights or rack? Sure, you can have them fitted - as extras - but what you see in the catalogue is totally bare, looks unsuitable, and is in effect advertised for considerably less than its true cost by the time you add all these things. Paul M - you raise an important point about cycle retail. I would add inappropriate advice and service as well as inadequate or inappropriate bikes to your list. A few weeks ago I was gratefully using the free bike pump outside a branch of a cycle retail chain store for the bikes of my wife's and I. Later on she told me that she overheard the young (male) sales assistant trying to get a young woman to buy a 'trendy' bike and getting a bit irked when what she wanted was a practical bike with an upright riding position and probably a basket on the front for practicality. My wife regretted not saying anything to the young woman afterwards about how the advice she was getting was totally inappropriate, and I was sorry not to have overheard it myself as I would have said something. I hear such stories from other people too about inappropriate bicycle advice. This has been a problem for many years. The advent of 'cycling cafes' and independent shops that cater for a younger 'trendier' crowd seems like something of a welcome development but even here there may be a slight tendency for bicycle fashion fascism, or 'fashism', if you will. But maybe I'm being a bit unfair. However, if much of the cycling retail sector is trying to sell bikes people aren't comfortable with, it doesn't bode well for the growth of cycling. Maybe I should get LCC to offer good advice on its website. As an aside, I recently bought a Dutch bike, and it is magnificent. I feel like I'm driving a Cadillac. The question that arises is, if the Dutch make bikes this good, might it even be slightly possible thay they make cycle facilities this good as well? As it is, my Dutch bike makes my cycling such a joy that even UK conditions are that bit better. Maybe there's a lesson there somewhere. P.S. Mark - Good luck with the urban conference! On holiday in Copenhagen and Malmo recently, I noticed that the proportion of women cycling was about equal with men, which seems vastly different from London. @Austen It *is* vastly different to here in London, indeed both Copenhagen and the Netherlands more women than men cycle due to the factors discussed above re single car families and fewer women learning to drive. When Mums can ride a bike it with their children it becomes a really fundamental and liberating thing. This post reminded me of a quote from an unidentified Baltimore preacher in 1896, who was complaining that most of his congregation was missing because they were out riding their bikes! Interesting and I agree with many points. Cycling is not all about racing, and the high profile sportwomen we have. There are a number of ladies/ women's cycle groups around the country (www.chesterfabulousladies.blogspot.com - there are inks to others in the country I have found so far) - we emphasise leisure and social cycling; and encourage women to come out get used to pedalling and their abilities. Must say I agree about retail - even good local bike shops seem to have a penchant for selling racing machines - they do look lovely, but without mudguards or a rack for a sensible bag, not under seat pouch - they are not suitable for touring and longer distance rides. Women encourage other women out; there is a very different feel in an all woman group than mixed, it is about confidence - not just with traffic but also mechanics (puncture) and getting lost.